A Nevada rancher appears to have backed down after threatening to open up a “range war” with the federal government if they rounded up the cattle he had illegally grazing on public lands. Authorities responded to the rancher’s threat with a show of force – an estimated 200 federal agents who descended on the scene – and rounded up the cattle. However, a large contingent of about a hundred antigovernment “Patriots” is now gathering near the site of the roundup as a form of protest and making their presence known. On Wednesday, the confrontation escalated into a brief dustup between federal law enforcement officers and the protesters, including the son of the rancher at the center of dispute, Cliven Bundy. During the ruckus, caught on video, Bundy’s adult son, Ammon Bundy, was shot with a stun gun that bloodied his shoulder. Eventually the officers retreated, amid much celebration by the protesters. The core of the dispute is Cliven Bundy’s ongoing claim to the right to graze his cattle on a sensitive piece of southern Nevada’s Mojave Desert known as Gold Butte. Bundy’s family had grazed cattle in the area for generations, but in 1993 Cliven Bundy stopped paying his fees on the land, claiming that the United States government was not the legitimate landlord. In 2013, a federal judge enjoined him from continuing to graze his cattle on the federal lands, an order he has studiously ignored. So this week, federal authorities moved into the area and began sweeping up Bundy’s trespassing cattle. 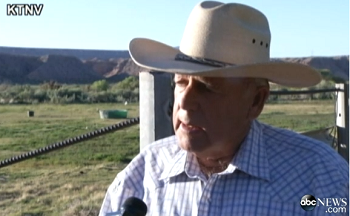 Bundy threatened a “range war” if Bureau of Land Management agents took custody of his stock, calling them “cattle thieves.” But, initially at least, the threats appeared to fizzle as the roundup of Bundy’s cattle proceeded apace, accompanied by a heavy law enforcement presence at the scene, while Bundy sputtered helplessly on the sideline. On Sunday, another adult son, 37-year-old David Bundy, was arrested after getting into a confrontation with the federal officers; afterwards, Bundy and his compatriots described for reporters their alleged ordeal the hands of federal officers. BLM officials, meanwhile, defend the crackdown on Bundy’s activities by noting that he is the only rancher in the region who refuses to acknowledge or heed the federal permit system for grazing rights. “Cattle have been in trespass on public lands in southern Nevada for more than two decades. This is unfair to the thousands of other ranchers who graze livestock in compliance with federal laws and regulations throughout the West,” the BLM website noted. Several interviews that Bundy has given over the years makes clear that he subscribes to Patriot movement theories about the legitimacy of the federal government, or the lack thereof, and to Posse Comitatus theories about the enshrinement of the powers of the county sheriff. He also has taken to comparing his confrontation with federal authorities to ill-fated clashes at Ruby Ridge, Idaho, and Waco, Texas, in the 1990s, that were infamous for inspiring militia organizing the fueled the Patriot movement then. Bundy’s campaign to ignore federal grazing laws has support among his fellow Patriots, who are now coming to his defense in far-right media outlets. This notably includes Alex Jones’ Infowars, which is avidly promoting the Bundy ranch story, as well as Pete Santelli’s Internet radio show. All of these outlets depict Bundy’s “range war” as a last gasp fight for American freedom against looming federal tyranny. A “We Support Cliven Bundy” Facebook page has a similar tone. Even the Drudge Report is adopting the Bundy story, leading the site’s front page with updates from the “Standoff At Nevada Ranch” (though in fact no standoff is taking place). So is Glenn Beck’s The Blaze, which has been headlining it on their website’s front page. As a result, the scene of the roundup has attracted an encampment of about a hundred “Patriots” and Bundy supporters who have parked along the roadside and harassed the roundup vehicles. They are keeping their anger over the presence of federal law enforcement officers and their firepower burning. Santelli, in his interview with Cliven Bundy on Monday, called for militias to turn out and protect Bundy and his family. And that appears in fact to be happening. The Las Vegas Review-Journal reported on Wednesday that two militiamen from Montana had joined the scene; one of them posed with a high-caliber long-range rifle, saying he and his cohort were there to protect the Bundys from “tyranny”. The scuffle on Wednesday appeared to follow efforts by the protesters to prevent vehicles involved in the roundup work from leaving the scene. At one point, officers began bringing in guard dogs and demanding that people get away from a truck whose exit had been blocked. At that point, some shoving and scuffling occurred, officers pulled out their tasers and Ammon Bundy was hit in the chest. Eventually the truck moved on and the law enforcement officers all got into their vehicles and followed the roundup vehicles away from the scene. The protesters were jubilant.